Good afternoon. It's a great pleasure to be here today to deliver a few closing remarks after your full day to pursue a career. In my maiden Policy Address announced last Wednesday, I said, amongst many other things, my Government will strive to do our best in youth development work in the next five years by addressing their concerns about education, career pursuit and home ownership, and encouraging their participation in politics, as well as public policy discussion and debate. I am glad that we – the Government and many financial experts – are gathering here to address one aspect of my commitment, that is, to enlighten and inspire many eager young talents waiting to embark on your career, putting your knowledge to good use, and testing your limits and strengths. I know many of you are considering a career in the financial services industry. I would say that that is a choice made in the right city and at the right time. Why is Hong Kong the right city for a career in finance? To start with, financial services is one of Hong Kong's pillar industries, a major contributor to the city's Gross Domestic Product, accounting for nearly 18 per cent of our GDP and 6.7 per cent of our total employment. This is a sector that is truly international and has put Hong Kong on the world map, which means that if you do it well here, you will have plenty of opportunities in other major financial centres. 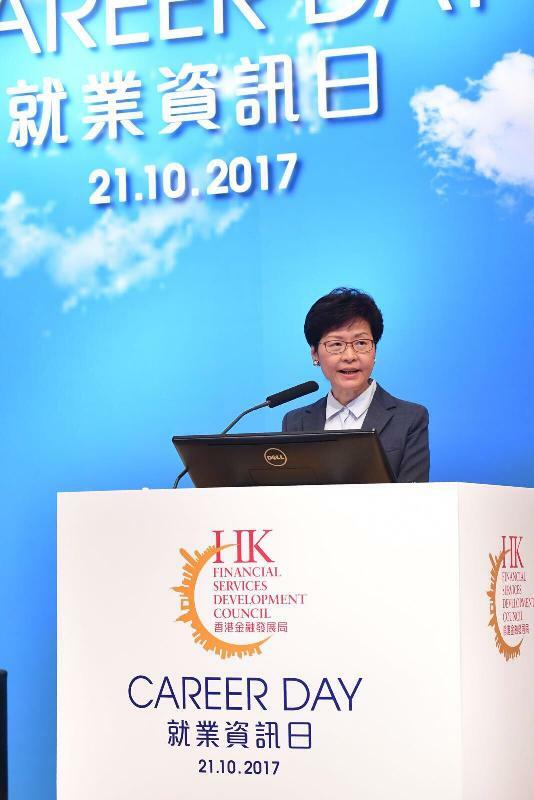 Indeed, Hong Kong's status as a leading international financial centre has long been recognised. In the latest Global Financial Centres Index, out last month, Hong Kong was ranked third, behind only London and New York. A few statistics underline those kudos. For the past two years, Hong Kong's stock market ranked first globally in funds raised through initial public offerings. Our IPO total last year came in at US$25 billion. Hong Kong's combined fund management business amounted to US$2.2 trillion in 2015, topping the league in Asia. Of the world's top 100 banks, 75 operate in Hong Kong. And you can count that as 75 potential employers. As part of China, Hong Kong has first-mover advantages open to no one else. In 2004, we were the world's first market to conduct offshore renminbi business. Today, we are the world's largest offshore renminbi business hub, handling 70 per cent of all renminbi payment transactions and contributing to the internationalisation of China's currency. The launch of the Shanghai-Hong Kong Stock Connect in 2014, the Mutual Recognition of Funds in 2015, Shenzhen-Hong Kong Stock Connect in 2016 and Bond Connect in July this year, are all of groundbreaking significance to capital market access between Hong Kong and the Mainland. Powered by the twin engines of China and the world, Hong Kong is the gateway, the multilateral bridge bringing together the Mainland and the rest of the world. There's another "why" to consider: specifically, why is this the right time? The continuing reform of the Mainland's financial markets, the internationalisation of the renminbi and the gradual opening-up of its capital account, together with the far-reaching Belt and Road Initiative, are attracting investors. And Hong Kong, tapping on its strengths as an intermediary, is particularly well-positioned to support capital flowing into, and out of, the Mainland. Hong Kong can provide Belt and Road countries with financial services for the investment, fund raising and asset management of infrastructure projects. We can also help expand their financing channels. Hong Kong has, in short, what it takes to become an international financial hub, to play a key role in mobilising funds for the Belt and Road's – and the region's – infrastructure projects. The Guangdong-Hong Kong-Macao Bay Area development adds another dimension to the Belt and Road Initiative and Hong Kong's prospects. The development calls for closer cooperation and deeper economic integration within the Bay Area city cluster, which embraces Hong Kong and Macau, together with nine Guangdong cities, including Shenzhen and Guangzhou. The Bay Area promises to enhance the global competitiveness of the Pearl River Delta region, while serving as an engine of the Belt and Road. That's particularly so in financial connectivity, infrastructure development and innovation and technology. Hong Kong and Shenzhen have already agreed to develop an Innovation and Technology Park in the Lok Ma Chau Loop area. Close to the boundary with Shenzhen, it will drive I&T for the Bay Area, creating opportunities for local tech companies to go global. The advent of financial technology has also created a new world of possibilities for the financial services sector. Fintech will enhance efficiency and change the way financial institutions operate. My Government is working with industry to promote the development of fintech here. Hong Kong and the United Kingdom recently signed a fintech agreement to collaborate in promoting financial innovation. As Hong Kong's home-grown fintech firms expand overseas, they will attract global players eager to use Hong Kong as a gateway into Mainland and other Asian markets. In my Policy Address delivered last week, while I emphasised the importance of diversifying our economy by developing innovation and technology as well as the creative industries, I also made it clear that the Government will reinforce and enhance our financial services sector. We will actively seize the opportunities brought by the Belt and Road Initiative and the Guangdong-Hong Kong-Macao Bay Area, so that the financial services sector can better serve our real economy. 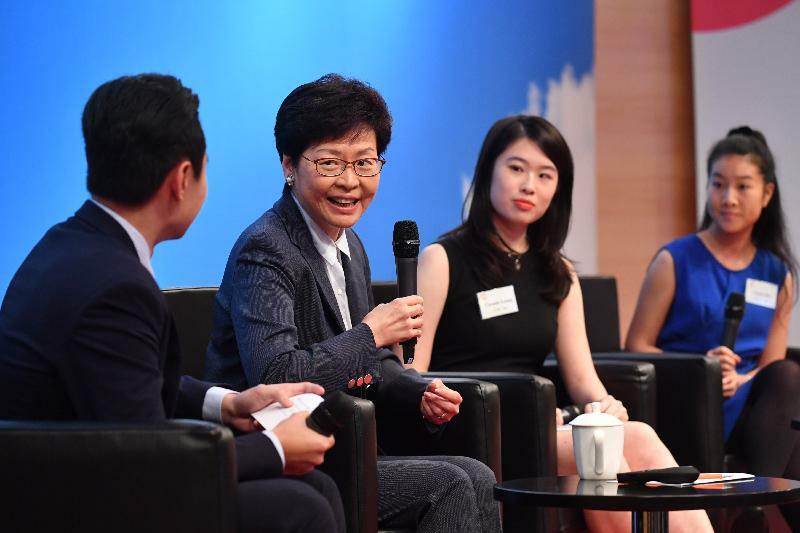 Specifically, as one of the policy initiatives put forward in my Election Manifesto, the Financial Leaders Forum chaired by the Financial Secretary has already been set up and the members are already putting their minds together in formulating strategic and forward-looking proposals to strengthen Hong Kong's position as an international financial centre. We will allocate more resources to the Financial Services Development Council to enhance its role in promoting market development and nurturing talent like the Career Day today. We will also take the lead in arranging the issuance of a Government green bond in the next financial year and promote the establishment of green bond certification schemes that meet international standards by local entities. These are just some of the many initiatives that my Government are implementing or will implement, but I trust they should be sufficient in convincing you that the Hong Kong SAR Government is determined to promote the development of the financial services industry, that the industry is full of promise, and that pursuing a career in it will give you plenty of opportunities to realise your potential. For those of you who are interested in such a career, I would encourage you to keep abreast of finance's traditional services, from asset and wealth management, to banking, corporate finance and insurance. I would also emphasise such fast-rising areas as fintech, green finance and infrastructure financing. The future belongs to those flexible enough to adapt – indeed, to embrace – the sector's emerging trends and market developments. Ladies and gentlemen, before I close, I would like to take this opportunity to thank the Financial Services Development Council for organising this Career Day, now its fourth year. I would also like to thank the Council for helping our youth keep abreast of the latest opportunities in the financial market through such programmes as the Practitioners Speakers Series and the Council's career website. I have no doubt that the Council will keep up its excellent work in this regard. Lastly, for the young people here today, I wish you all great success with your future career, which is important not only to you, but to Hong Kong as well.